The average salary for a Penetration Tester is $111,916 per year in the United States. 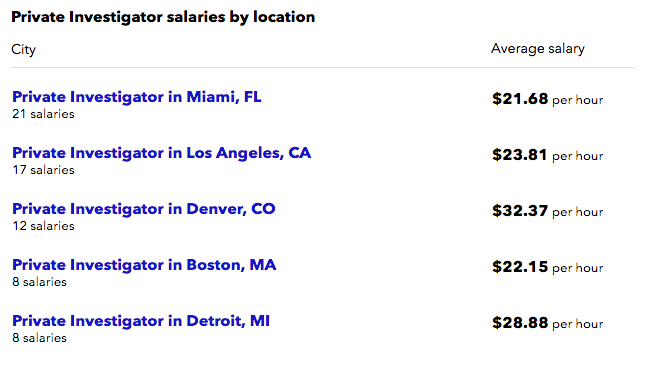 Salary estimates are based on 286 salaries submitted anonymously to Indeed by Penetration Tester employees, users, and collected from past and present job advertisements on Indeed in the past 36 months. How much does an IT Security Specialist make in the United States? The average salary for an IT Security Specialist is $106,342 per year in the United States. Salary estimates are based on 4,994 salaries submitted anonymously to Indeed by IT Security Specialist employees, users, and collected from past and present job advertisements on Indeed in the past 36 months. The typical tenure for an IT Security Specialist is less than 1 year. 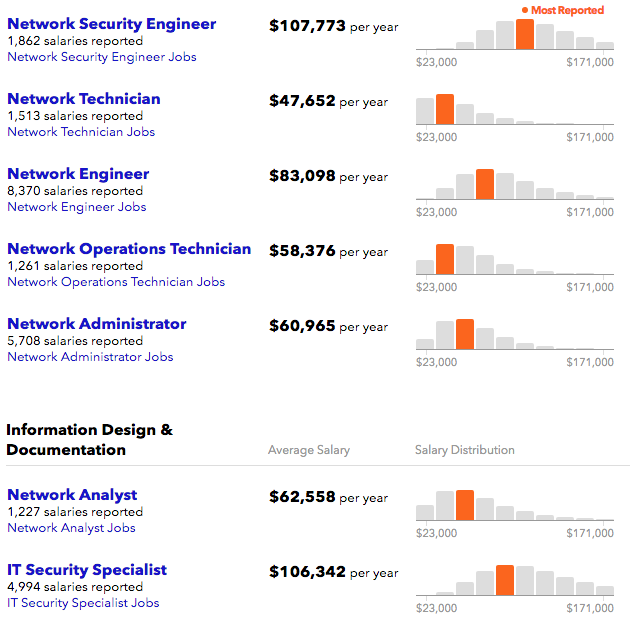 How much does a Network Security Engineer make in the United States? The average salary for a Network Security Engineer is $107,773 per year in the United States. 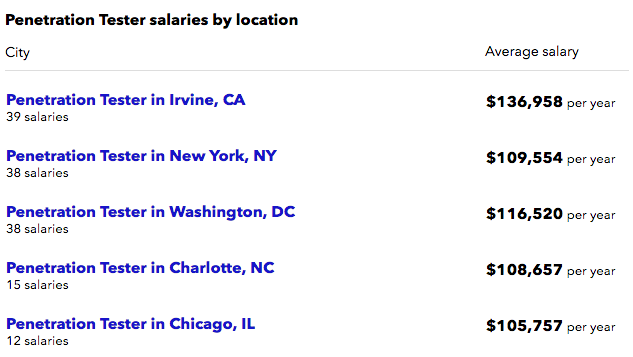 Salary estimates are based on 1,862 salaries submitted anonymously to Indeed by Network Security Engineer employees, users, and collected from past and present job advertisements on Indeed in the past 36 months. The typical tenure for a Network Security Engineer is 1-3 years. How much does an Information Security Analyst make in the United States? The average salary for an Information Security Analyst is $80,928 per year in the United States. Salary estimates are based on 2,024 salaries submitted anonymously to Indeed by Information Security Analyst employees, users, and collected from past and present job advertisements on Indeed in the past 36 months. The typical tenure for an Information Security Analyst is 1-3 years. The average salary for "cyber security engineer" ranges from approximately $85,999 per year for Engineer to $106,342 per year for IT Security Specialist. Salary information comes from 55,348 data points collected directly from employees, users, and past and present job advertisements on Indeed in the past 36 months. The average salary for "computer forensics" ranges from approximately $52,732 per year for Examiner to $107,773 per year for Network Security Engineer. Salary information comes from 29,216 data points collected directly from employees, users, and past and present job advertisements on Indeed in the past 36 months. The average salary for "incident response and forensic investigator" ranges from approximately $11.90 per hour for Security to $54.66 per hour for Network Security Engineer. Salary information comes from 12,953 data points collected directly from employees, users, and past and present job advertisements on Indeed in the past 36 months. The average salary for "Cisco Security" ranges from approximately $47,652 per year for Network Technician to $107,773 per year for Network Security Engineer. Salary information comes from 35,201 data points collected directly from employees, users, and past and present job advertisements on Indeed in the past 36 months. The average salary for a Private Investigator is $26.02 per hour in the United States. Salary estimates are based on 572 salaries submitted anonymously to Indeed by Private Investigator employees, users, and collected from past and present job advertisements on Indeed in the past 36 months. The typical tenure for a Private Investigator is 1-3 years. Information on salaries listed above was gathered from indeed.com.